Introducing kids to a place built just for them. A camp experience provides children with opportunities to make friends, discover strengths and find confidence in themselves. For some first-time campers, though, the idea of going to camp can be daunting— especially if they are uncertain about what exactly goes on at camp. Below is a list of common questions newbies have, and answers to help them understand the ins and outs of this summer experience. At camp, what will I do all day? You’ll get to do so much. Common activities include swimming, tennis, basketball, arts and crafts, softball or baseball, cooking, ceramics, gymnastics, soccer, dancing, football— the list goes on and on. There are also special events and entertainment. Who will help me have fun at camp, and how do they know how to care for me? Counselors are selected because they love working with kids. They are trained before summer starts to ensure you have a good time, make friends and experience a variety of activities. Their job is to help you have fun, be safe and know your limits. You will become pals with lots of kids at camp. Some campers know each other from past summers or school, but many come to camp in order to meet new peers. Counselors guide you in making acquaintances the day you arrive. It’s a special place where grown-ups help kids feel good about themselves. Campers are encouraged to try new things, learn different skills and be a good friend. 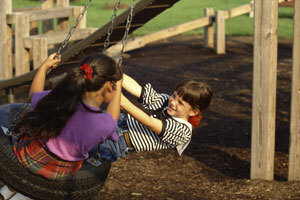 Think of it as a little community where everyone’s opinion is heard, and kids work and play together. Days are filled with different activities. If you’re going to day camp, the fun begins as soon as the bus picks you up. If you’re at sleepaway camp, you’ll probably wake up, along with the other kids in your bunk, get dressed and go to breakfast. You spend the day doing things you really like. Of course you’ll stop for lunch— maybe a barbecue or a picnic. Day campers head home in the late afternoon. Sleepaway campers do more activities in the afternoon and then have dinner and evening events like campfires and plays together. Bedtime is a time for kids to share their best moments of the day with bunkmates and counselors. Will I get to choose activities? The amount of choice you have depends on the camp. At most camps, there is at least some choice. Sometimes you make selections for yourself, and sometimes campers in a group decide together what they want to do. This is one of the best parts of camp. Counselors are chosen because they enjoy spending time with kids, and respect and listen to them. Before camp begins, counselors learn how to best care for youngsters and help them make the most out of summer activities. There are lots of people in this environment to help take care of your needs, dilemmas or issues. There is a nurse or a doctor if you don’t feel well and a place, sometimes called an infirmary, to rest until you are better. You can count on the grown-ups to help you with any problem you have.